Today, EU negotiators in Strasbourg struggled to craft the final language of the Copyright in the Single Digital Market Directive, in their last possible meeting for 2019. They failed, thanks in large part to the Directive’s two most controversial clauses: Article 11, which requires paid licenses for linking to news stories while including more than a word or two; and Article 13, which will lead to the creation of error-prone copyright censorship algorithms that will block users from posting anything that has been identified as a copyrighted work -- even if that posting is lawful. This means that the Directive will not be completed, as was expected, under Austria’s presidency of the European Union. The negotiations between the European Parliament, representatives of the member states, and the European Commission (called “trilogues”) will continue under the Romanian presidency, in late January. The controversy over Article 13 and Article 11 has not diminished since millions of Europeans voiced their opposition to the proposals and their effect on the Internet earlier this year. Even supporters and notional beneficiaries have now grown critical of the proposals. An open letter signed by major rightsholder groups, including movie companies and sports leagues, asks the EU to exempt their products from Article 13 altogether, and suggest it should only apply to the music industry’s works. Meanwhile, the music industry wrote their own open letter, saying that he latest proposed text on Article 13 won’t solve their problems. These rightsholders join the world's most eminent computer scientists, including the inventors of the Internet and the Web, who denounced the whole approach and warned of the irreparable harm it will do to free expression and the hope of a fair, open Internet. More than four million Europeans have signed a petition opposing Article 13. The collective opposition is unsurprising. Months of closed-door negotiations and corporate lobbying have actually made the proposals worse: even less coherent, and more riddled with irreconcilable contradictions. The way that the system apportions liability (with stiff penalties for allowing a user to post something that infringes copyright, and no consequences for censoring legitimate materials) leads inexorably to filters. And as recent experiences with Tumblr's attempt to filter adult material have shown, algorithms are simply not very good at figuring out when a user has broken a rule, let alone a rule as technical and fact-intensive as copyright. What is worse, the Directive will only reinforce the power of US Big Tech companies by inhibiting the emergence of European competitors. That's because only the biggest tech companies have the millions of euros it will cost to deploy the filters Article 13 requires. Proponents of Article 13 stress that the dominance of platforms like Google and Facebook leaves them with insufficient bargaining leverage and say this leads to a systematic undervaluing of their products. But Article 13 will actually reduce that leverage even further by preventing the emergence of alternative platforms. Compromises suggested by the negotiators to limit the damage are proving unlikely to help. Prior to the Trilogue, Article 13 was imposed on all online platforms save those businesses with less than 10 million euros in annual turnover. Some parties, realising that this will limit the EU tech sector, have suggested changing the figure, but doubling that figure to 20 million doesn’t help. If you own a European tech company that you hope will compete with Google someday, you will have to do something Google never had to face: the day you make the leap from 20 million euros in annual turnover to 20,000,001 euros, you will have to find hundreds of millions of euros to implement an Article 13 copyright filter. Others have proposed a "notice-and-staydown" system to reassure rightsholders that they will not have to invest their own resources in maintaining the copyright filters. 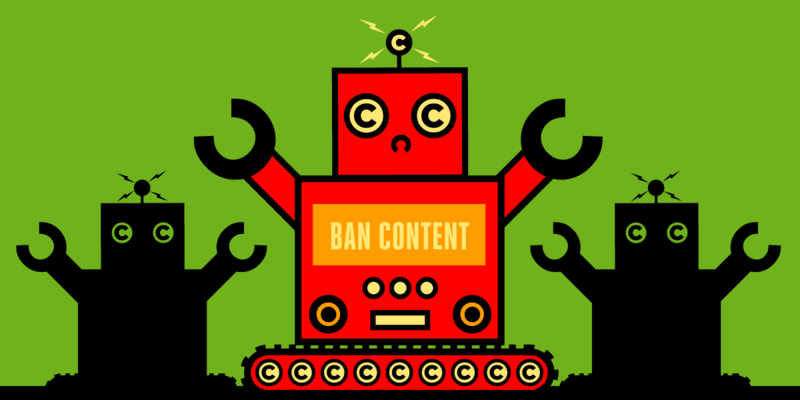 But creating this model for copyright complaints extinguishes any hope of moderating the harms Article 13 will do to small European companies. Earlier drafts of Article 13 spoke of case-by-case assessments for mid-sized platforms, which would exempt them from implementing filters if they were judged to be engaged in good faith attempts to limit infringement. But notice-and-staydown (the idea that once a platform has been notified of a user's copyright violation, it must prevent every other user from making such a violation, ever) necessarily requires filters. Others in the negotiation are now arguing that microenterprises should have to pay the burden, and are pressing for even these small and mid-sized business exemptions to be deleted from the text. With European internet users, small business people, legal experts, technical experts, human rights and free speech experts all opposed to these proposals, we had hoped that they would be struck from the Trilogue's final draft. Now, they are blocking the passage of other important copyright reforms. Even Article 13 and 11’s original advocates are realising how much they depend on a working Internet, and a remuneration system that might have a chance of working. Still, the lobbying will continue over the holiday break. Some of the world’s biggest entertainment and Internet companies will be throwing their weight around the EU to find a “compromise” that will keep no-one happy, and will exclude the needs and rights of individual Internet users, and European innovators. Read more about the Directive, and contact your MEPs and national governments at Save Your Internet.